It's been a while since I have done a recipe post. I don't cook that much these days. I have handed over the reins of the kitchen to our cook, the legendary Bunkin Banu. She makes Bengali dishes basis what my mom and I have taught her. The odd Parsi dish my mother has taught her. And brings in her own repertoire of dishes. I usually enter the kitchen these days to make the odd Hakka Noodles and grills and that's about it. I recently cracked something with lots of help from Twitter, Facebook and Instagram and thought I will share it here. Once again a grill, but an interesting one. I went to the Khar station fish market this weekend and finally bought a whole snapper (around Rs 300 post discount). I had eyed snappers on earlier visits too. This is the first time I bought one. 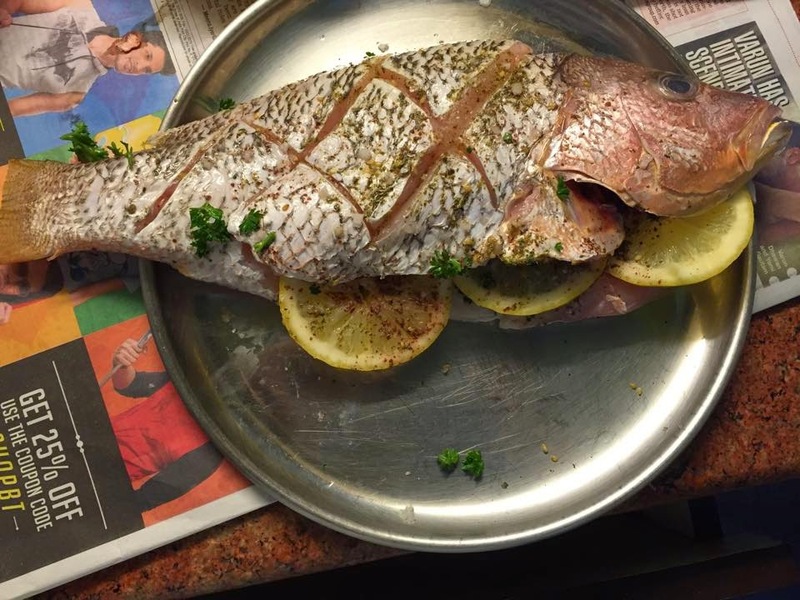 I wasn't sure how long to cook it for and put up a picture of the snapper on social media for ideas. Lot of people came up with suggestions. Nikhil of the blog Nonchalant Gourmand, tweeted to me saying that I should consider steaming it in Chinese sauces. This was a good suggestion but I wanted to cook it the first time around in spices such as sumac and zatar that Ishita, of the blog Ishita Unblogged, gave us in Dubai. Mallika, of the blog Miss Masala, on instagram said that I needed to cook it for 20 min. Earlier I thought that 10 minutes would do. My college mate, Jonaki, who is married to a chef gave some detailed instructions on Facebook and that's what I followed the most. "Just saw this - basic but best way to cook is first salt inside the belly, then add rosemary, garlic, thyme and lemon wedges (all inside, so they impart flavour but don't burn. Close the belly as tight as possible). Spread olive oil on the surface of the skin (but no herbs) so the skin crisps in cooking. Also (the professional here adds) : if you're using an open grill, it's best not to score the skin. Keeps juices in. If roasting in the oven, and using a grilled metal tray, also better not to score. If using a solid tray in the oven, then scoring is ok, but raise the fish off the flat surface with pieces of celery/celeriac or similar, and drizzle white wine on the tray (not on fish). Cooking approx 20 mins depending on oven. Easy way to check - see if the lateral bone closest to the tail slides out easily. "" The scoring was already done and when I cooked on a wire rack I realised what she meant about the juices oozing out. Here's how I cooked the snapper. I sprinkled some sea salt, sumac and zatar on the inner belly of the snapper. I then put in three slices of lemons (big ones, not our small desi limes, which I got from Lalu's at Pali market) and chopped parsley. The lime was based on memories of the trout Allison had cooked for us in Sydney. The parsley inspired by the tabbouleh that we recently had in the Lebanese Village Kitchen in Dubai. I was aiming at a Lebanese themed grill. 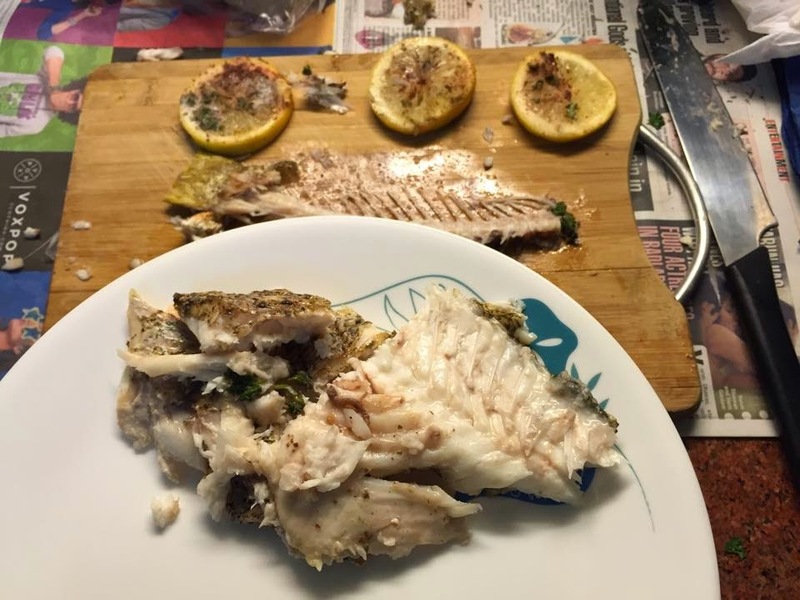 I then brushed on a bit of extra virgin olive oil on the skin of the fish and sprinkled some salt. I preheated the oven for 10 min at 200 c and then put in the snapper for 10 min at 200 C. I wish I had some string to tie it up as I have seen on telly. After ten minutes I took out the fish, gingerly turned it around, and put it in for 10 min at 200 C.
After it was done we let it rest for 10 min. I was not sure how it would turn out and had not even bothered to take out the camera to photograph it. My friend, G, on Facebook was quite confident thoug and kept egging me on. Turned out she was right. The fish was cooked beautifully. The skin had a nice sheen. The flesh was tender, moist and had a subtle flavour of the spices. There was a slight tangy taste to it but squeezing the lime which was inside the fish on to the fish, helped. 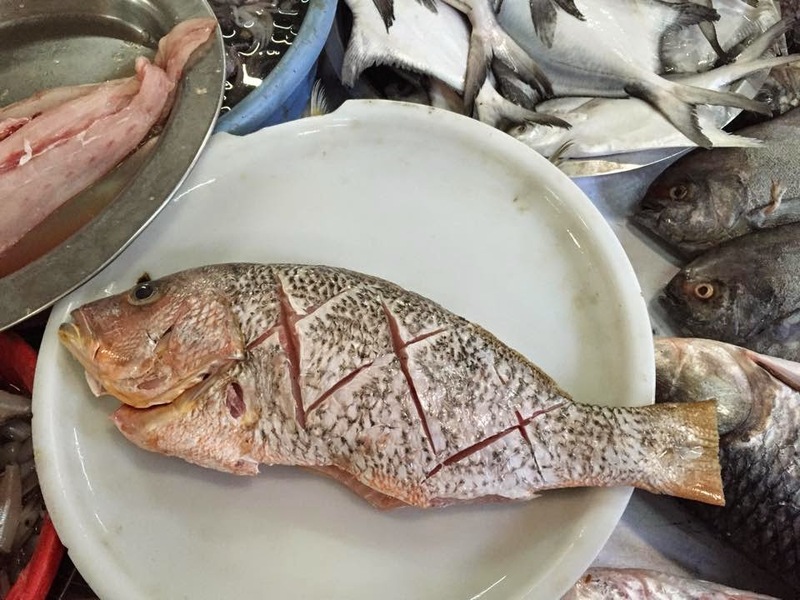 The fish was quite well seasoned. During the old Dubai food walk, that Arva Ahmen of Frying Pan Adventures conducted, Arva told us that cooking in the desert is pretty minimalistic and the spices are used to embellish and not over power and that the cooking techniques are pretty simple. 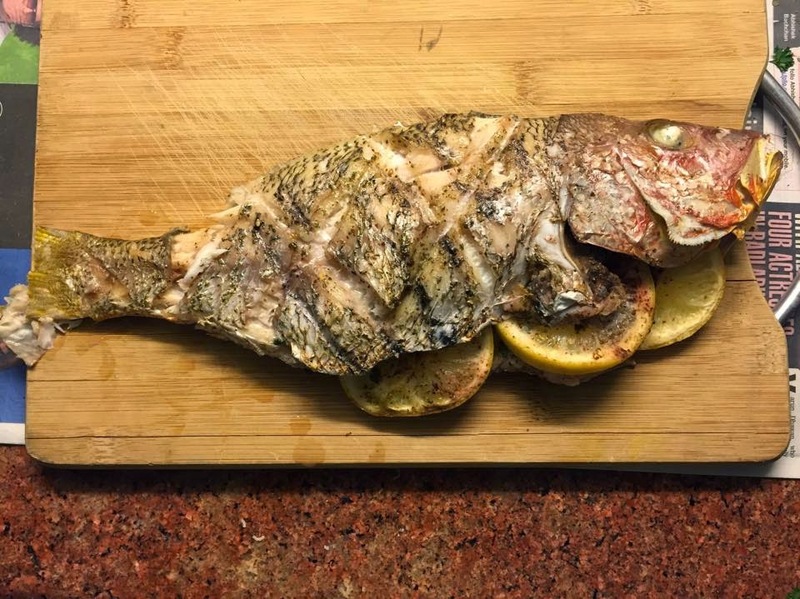 While I didn't follow any recipe I have a feeling that a Lebanese mama would not entirely disapprove of the grilled snapper. thanks for egging me on while It grilled Gia. Actually the tanginess was very mild so we liked it. Are you off fish too now?